San Francisco is a unique region in California’s housing landscape. Here, home prices have far surpassed the pre-Millennium Boom years and jobs are fully recovered due to the presence of the high-paying tech industry. All the same, high prices and limited inventory have shut out many residents, causing a housing crisis for renters and homebuyers alike. Further, the region’s enviable jobs recovery does not shield San Francisco residents from rising mortgage interest rates, which have crippled home sales across the state. Expect to see San Francisco’s rapid home price increases continue to cool in 2019 in reaction to rising interest rates and more tepid homebuyers. The next economic recession, expected in 2020, will see home sales and prices fall across California, and San Francisco will be no exception. View the charts below for current activity and forecasts for San Francisco’s housing market. *first tuesday’s forecast is based on monthly sales volume trends, as experienced so far this year, and economic conditions affecting the market. 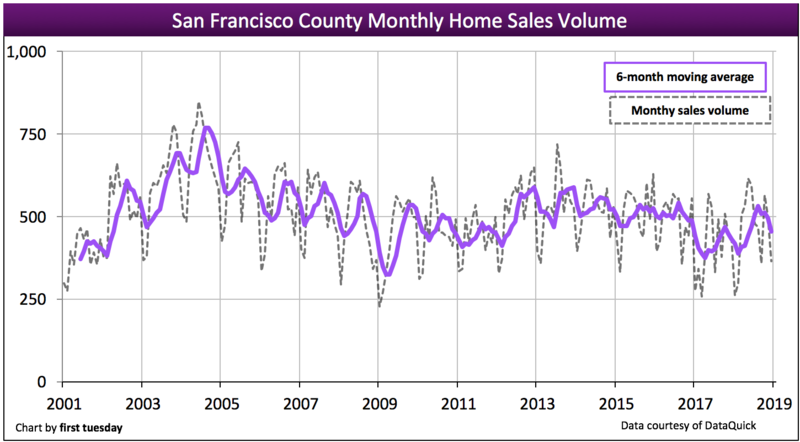 Home sales volume in San Francisco County is volatile, but has tended to run a step ahead of the rest of the state. San Francisco home sales volume peaked in 2004 — a year before the statewide peak — before receding in 2005-2006. Home sales volume bumped along at a relatively level-to-down annual pace in 2012-2016, but fell significantly in 2017, a signal of the statewide downturn in sales taking place in 2018. But this decrease reversed course in 2018, with year-end totals up 12% from 2017, yet still below 2016 numbers. San Francisco, with its heavy concentration of high-paying tech jobs and depressingly low housing inventory, is almost an economy unto itself. However, 2018’s upturn in sales volume does not indicate a continued trend. Rising mortgage interest rates, decreased economic expectations and still-high home prices in the region will like cause homebuyer enthusiasm to soften in 2019. 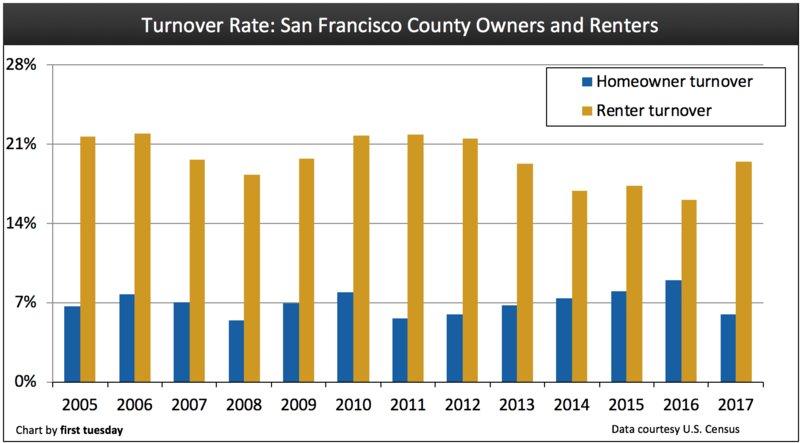 San Francisco’s renter turnover rate rose significantly in 2017 to nearly 20%, meaning one-in-five San Francisco renter households moved in 2017. On the other hand, the homeowner turnover rate (producing sales and relocating buyers) fell sharply in 2017 to just 6%. This low turnover rate is reflected in the steep drop in sales volume also experienced in 2017. Renter and homeowner turnover rates indicate both the willingness and corresponding ability of renters and homeowners to move. With the loss of jobs and income during the Financial Crisis and 2008 Great Recession, turnover rates in San Francisco fell. However, both renter and homeowner turnover rates recovered more quickly in San Francisco than elsewhere in the state due to the region’s swift jobs recovery and high concentration of employers. Following the recession, renters in particular regained a higher level of mobility, as the young professional class inhabiting San Francisco is often more inclined to rent than own. However, the significantly high rents in San Francisco are now swiftly pushing renters out of the city and into the nearby counties of Alameda and Contra Costa. Those with rent-controlled apartments strive to stay put which kills turnover and new construction. Looking forward, turnover rates will likely be highest in 2021-2022, one year ahead of the rest of the state. These years will see the confluence of Generation Y (Gen Y) first-time homebuyers and retiring Baby Boomers (Boomers) hitting the home buying market at once. The homeownership rate in the Bay Area tends to vary more wildly than other parts of the state. However, the general trend from the end of the Millennium Boom until 2015 had been down. The homeownership rate climbed in 2015, only to drop back in 2017-2018 to its current level of 55.7%. 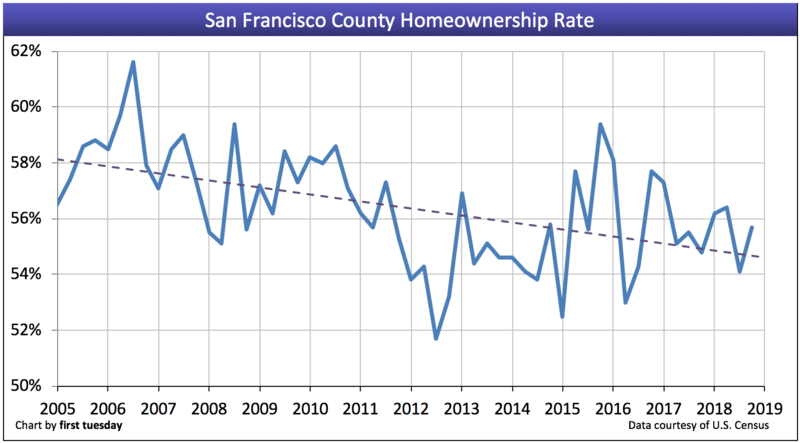 However, the homeownership rate in San Francisco has not suffered quite as much as the rest of the state during this protracted recovery due to the job support delivered by its successful tech industry. All the same, as the homeownership rate in the rest of the state catches up to pre-recession levels in the coming years, don’t expect San Francisco to follow. Due to the high cost of housing and the allure of city living, renting is often preferred in San Francisco. Home prices in San Francisco continue to exceed prices of a year earlier, but month-to-month changes are beginning to falter in the mid and high tiers. Low-tier prices are 4% higher than a year earlier, mid-tier prices are 5% higher and high-tier prices are 3% higher than a year earlier as of Q4 2018. San Francisco home prices are characterized by rapid starts and stops, as viewed in the bumps in the chart above — particularly in the mid- and high-tiers. 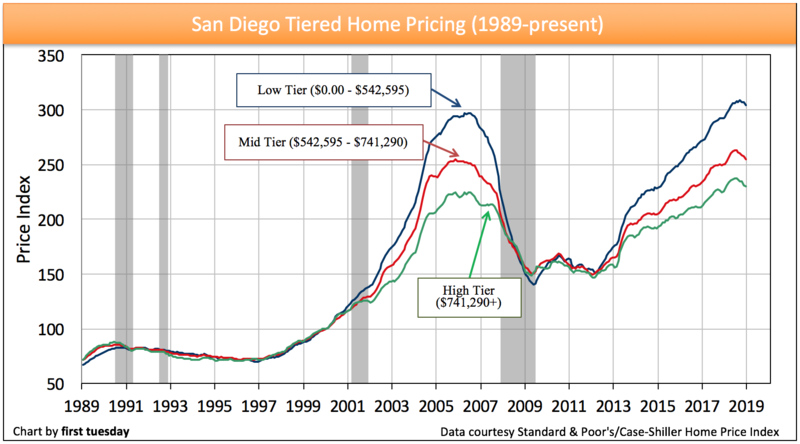 Pricing in Southern California markets form a smoother line. San Francisco’s low supply situation is partly to blame, creating a volatile home sales market. The city’s preference for low-density zoning restricts builders from meeting the ever-increasing demand for local housing. 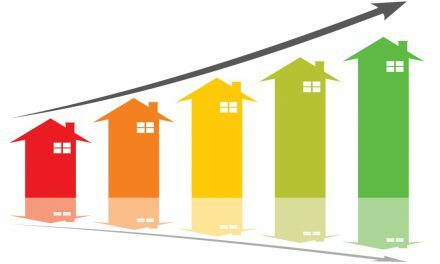 Use of adjustable rate mortgages (ARMs) and jumbo loans keep home prices high in a momentum-hot market, as homebuyers quickly lose purchasing power due to upward shifts in interest rates and pricing outruns income growth. When ARM use increases as rapidly as it has in the area, the outlook for stable sales volume and pricing in the housing market becomes less optimistic. Prices adjust downward following periods when ARM-to-loan ratios rise and fixed mortgage rates do not. Very few single family residences (SFRs) are built in San Francisco County each year, though this number is increasing slightly. 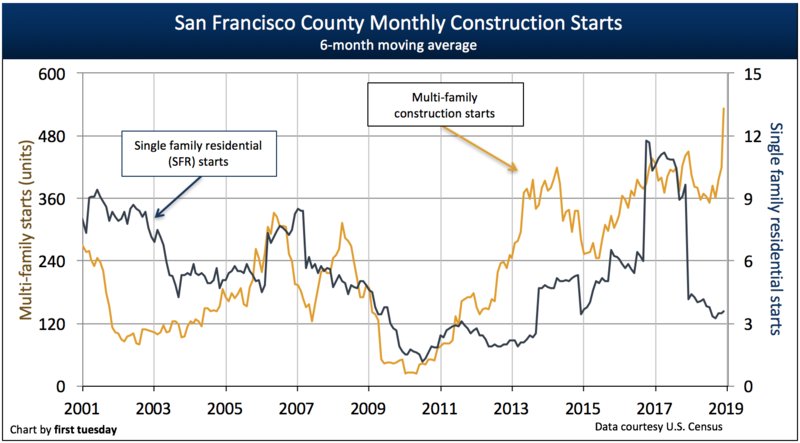 Multi-family construction starts, on the other hand, have increased swung wildly from year-to-year, though the general trend has been up since their bottom in 2010. The long approval and permitting process in San Francisco holds down construction starts of all types. 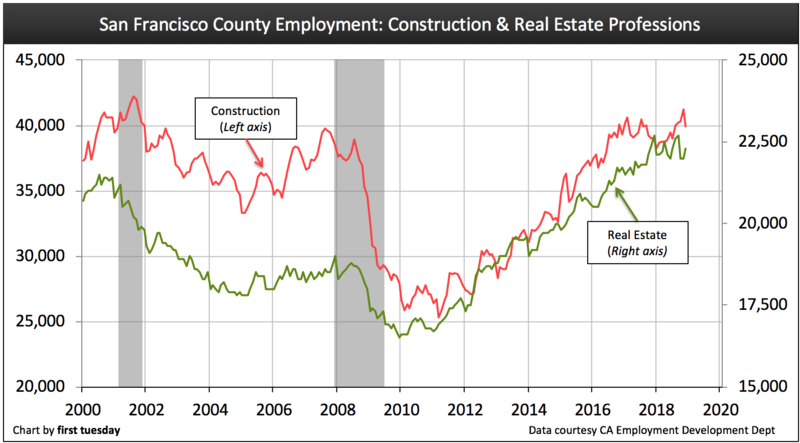 As jobs continue to increase in San Francisco, multi-family construction may feel the benefits. San Francisco’s high-paying tech industry draws a younger population (members of Gen Y), who are most likely to reside in multi-family structures close to the urban amenities San Francisco offers. However, archaic zoning limiting building height and the density of units in each structure will impair multi-family starts, population mobility and job growth going forward while driving up rents and causing employers to consider other communities. 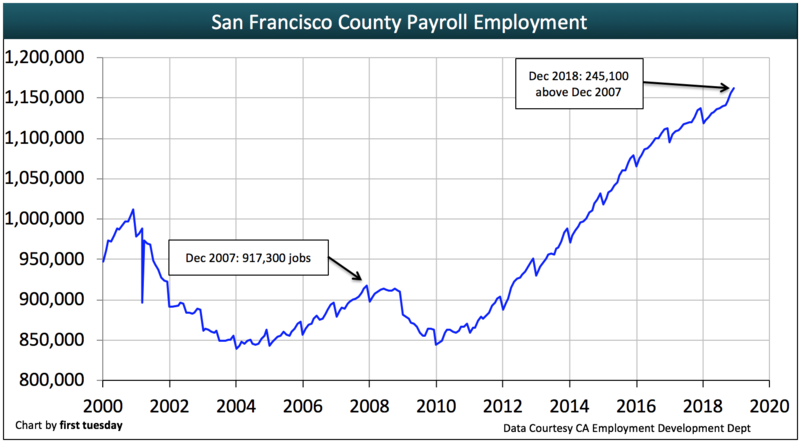 San Francisco’s jobs market has well surpassed the point for recovery. Homeowners and renters require income (generally from employment) to make mortgage or rent payments. 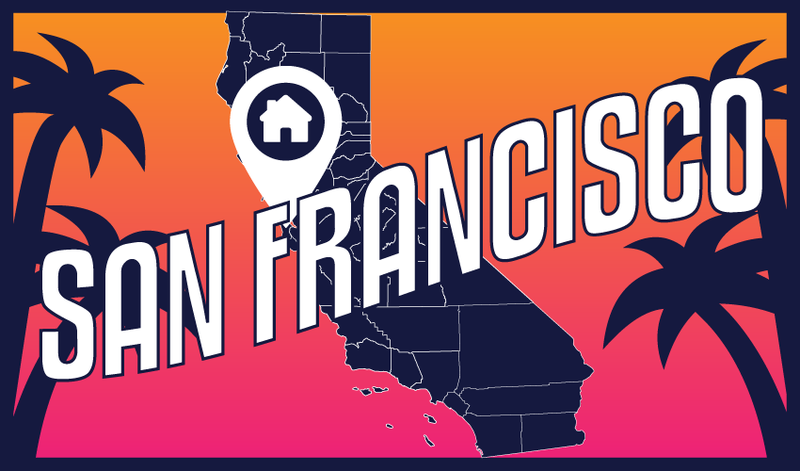 As a result, San Francisco’s housing market has recovered more swiftly than the rest of the state due directly to its quick healing and expansion in the jobs market. Jobs have met and exceeded residents’ need for employment, even including San Francisco’s population increase of roughly 70,000 working-age individuals since the start of the 2008 Great Recession. By a statewide comparison, California just caught up to pre-recession levels in mid-2014, not likely to meet the intervening population increase until 2019 or 2020. The number of people employed by each of San Francisco’s top employing industries has increased over the prior year. In particular, Professional and Business Services, which includes the technology and support industries, has added the most jobs during this economic recovery. Employment in the real estate industry has exceeded pre-recession levels. The construction industry is also recovering, its pace quickening in recent months. Future growth for these industries will rely on the success of the multi-family housing sector, which will continue to see growth throughout this decade. Per capita income in San Francisco is roughly double that of California’s. 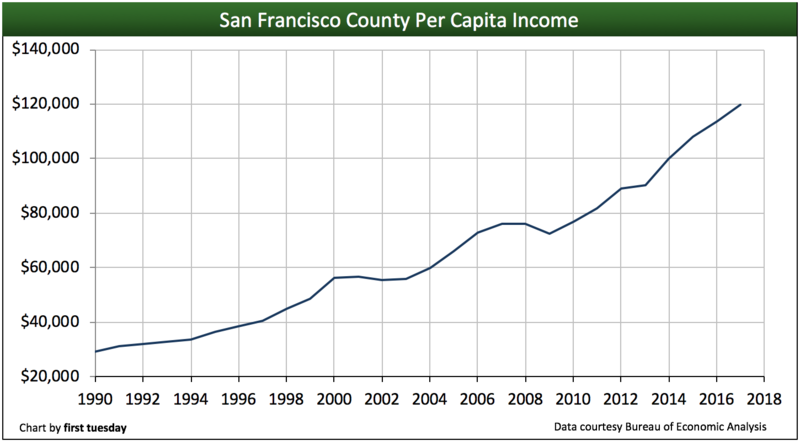 Further, San Francisco’s per capita income has far exceeded its pre-recession peak. However, San Francisco residents spend on average a debilitating 41% of their income on housing expenses. Many more simply cannot afford to live in the city and are forced out to the suburbs, the only place where their paycheck qualifies them for housing. If you’re looking for indications of where California’s housing market will be in two to three years, take a look at San Francisco County. Here, jobs and income have fully recovered. All the same, home sales volume remains stuck in its bumpy plateau — flat. 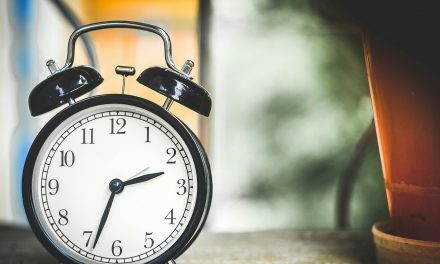 Sales are likely to fall back in 2019 due to rising interest rates and too-high home prices. For, even though incomes here are higher than virtually anywhere else in the state, rising incomes still don’t keep up with the cost of housing. NextPOLL: Who better controls the price in negotiations? 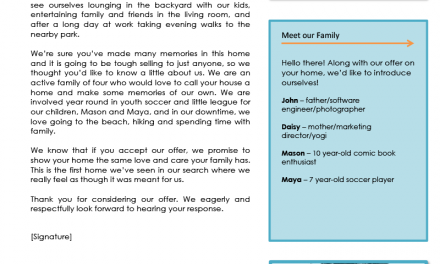 Interesting, not a word about foreign investors into the SF real estate market. Or perhaps there is no data to track such metrics or the article is just being pc. ZIRP and mortgage availability is what has caused the current housing bubble, inflation and a rise in interest rates are the only things that will pop it. This is crap, why? Most of the sale price increases have not come from “real” buyers, just speculation. Speculation is very unhealthy and will lead to a sell-off. The recent massive of building projects, condos, will lead to a glut. Speculators are exiting, high paying jobs are starting to leave. Has anyone done the math on how a median home income of 84,000 can be useful to buy a house in San Francisco? Or, how will these people come up with 267,000 down payment, let alone, qualify for a loan. The median household income is only good for paying up 450,000, not 1.2 million…How come the media ignores this? I don’t think more than 1 percent of people under 45 can qualify for any kind of jumbo loan, who will buy the homes, where are the “real “buyers? We already had the biggest property crash in American history. The next one will be different. The last one was a collapse in over-inflated entry level housing. The next one will see a crash in over inflated high end housing.